Determined to enlighten his new neighbors, DiRuocco began buying espresso-making machines in Italy and renting them to Bay Area restaurants and cafés. Training, repairs and coffee beans were included in every deal. Early clients included Chez Panisse, the Bay Wolf and Caffe Mediterraneum. Thirty-five years after those modest one-man beginnings, Mr. Espresso’s high-flying clients now include Perbacco, Pizzeria Delfina, Oliveto, Il Fornaio, C’era Una Volta, Coffee Bar and La Note, among many others. 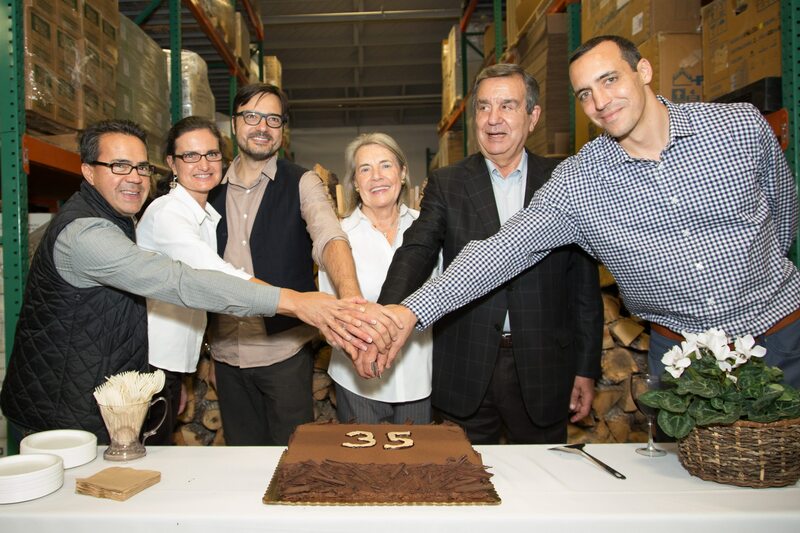 “We buy our beans from all over the world and roast them only with oakwood,” Marie Françoise DiRuocco explained as she guided us around the expansive headquarters, which was originally three separate units. Spacewise it’s a big step up from Mr. Espresso’s original 750-square-foot facility in Alameda. Sons John and Luigi and daughter Laura play varying roles in the company along with their parents. 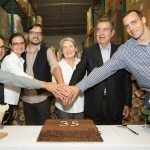 Along with roasting equipment, neat but massive piles of oakwood and a warehouse stocked nearly floor-to-ceiling with beans, also on display around the facility are gleaming Italian-made vintage espresso machines. 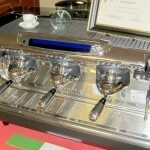 Most bear the trademark of Italy’s most-coveted brand: Faema, the Cadillac of Italian espresso machines. Looking like a cross between roadster grilles and UFOs, these shiny, complicated marvels have made countless cups of espresso, cappuccino and their hot and cold cousins. 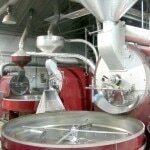 “We feel very responsible to offer good machines and good coffees that make a good product. We are very particular,” Marie Françoise explained. For more information, visit Mr. Espresso’s webpage. The Di Ruocco family celebrates Mr. Espresso’s 35th anniversary. Image courtesy of Mr. Espresso. Coffee-roasting equipment at Mr. Espresso’s Oakland warehouse. Photo courtesy of Kristan Lawson. 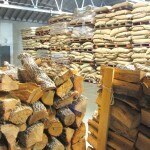 Stacks of oakwood and coffee beans at Mr. Espresso’s Oakland warehouse. Photo courtesy of Kristan Lawson. One of many vintage espresso machines on display at Mr. Espresso’s Oakland warehouse. Photo courtesy of Kristan Lawson.